was held in Houston on September 17, 2004. This tournament was an event of the ABB Golf League, a group of 30 or more golfers of which Thom had been a member. Good memories and humorous anecdotes about him must have brought smiles and solace to his golfing buddies. It was a fitting way to remember and honour such an ardent golfer. 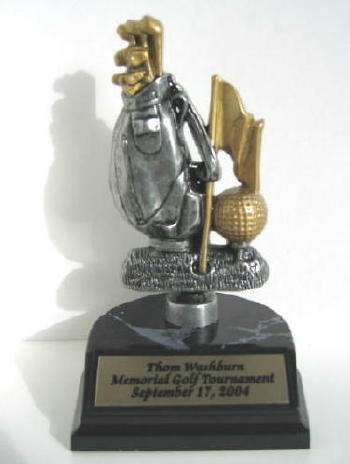 Each participant received a memento. On behalf of Thom's colleagues and friends, Rudy Aleman, League Chairman, also sent one of the mementos, pictured above, to Thom's parents. We treasure the affection this shows that you had for our son. Thank you.